The power of optical illusion has been enlisted to help guide passengers at Tokyo's Haneda airport. 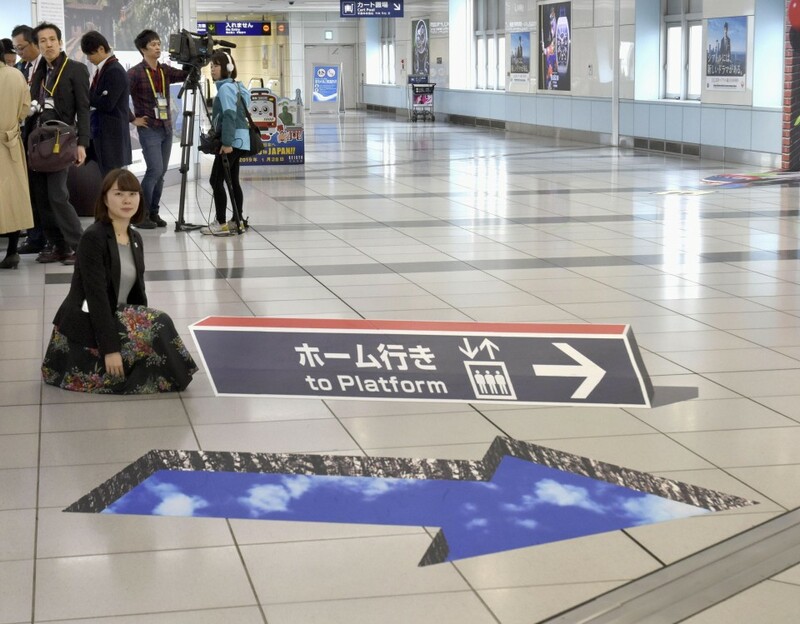 Keikyu Corp., the operator of the Keikyu train network in the metropolitan area, has installed signs that appear to pop up from the floor in the style of 3D street art at Haneda Airport International Terminal Station. The signs guide passengers who have flown into the airport toward nearby elevators to reach underground train platforms. According to Keikyu, most passengers carrying large suitcases or carts miss the elevators and go instead straight to the escalators. There was a mishap in August last year in which a suitcase fell on the escalator and hit another passenger, an official of the company said, adding no one was injured. One of the "pop-up" signs is a large arrow showing the location of the elevators and the other carries an image of the elevator and the words "to Platform." Masaya Togawa, a Keikyu official involved in the project, said Monday that the company hopes the signs will help many passengers, including foreign tourists. The signs were designed by Kokichi Sugihara, an expert on optical illusion at Meiji University. Keikyu has also prepared a spot where photos can be taken of children with a similar 3D image of a Keikyu train "popping out of the wall."